Pradakshina Patha is an important architectural feature of a Hindu Temple. It is the term used to refer to the passage around the garbha griha or the sanctum sanctorum in a Hindu temple. The passage is essentially provided for performing pradakshina (going around the deity). While walking on the Pradakshina Patha the devotee establishes divine communion with the deity seated or standing in the sanctum sanctorum. The various forms for the deity and other aspects carved on the outer walls of the sanctum and in some instances even on the Pradakshina Patha acts as points of concentration which helps in guiding the devotee towards the main murti enshrined in the garbhagriha. Pradakshina Patha is an enclosed passage or sometimes in the open courtyard surrounding the temple. Sometimes it is on a platform (jagati). 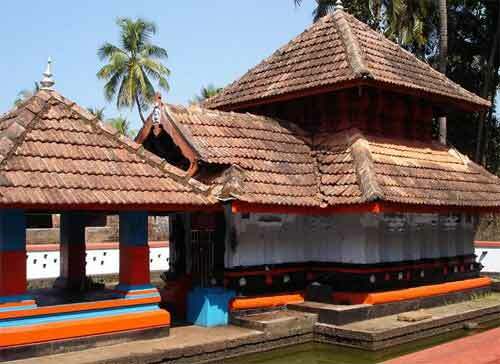 Scriptures dedicated to temple architecture have divided temples based on Pradakshina Patha. Those with a path are known as Sandhara and those without is known as niradhara. Sandhara temples have pradakshina patha enclosed and while approaching the sanctum, the devotee is within the sacred precincts. Niradhara temples have no pradakshina patha and the temple is beheld in its full view, imparting a total exposition of its meaning. The deity in the shrine emanates its energy on all sides. It is to be seen and comprehended by walking on the pradakshina patha. The shape of the path is the primordial nature of the world.